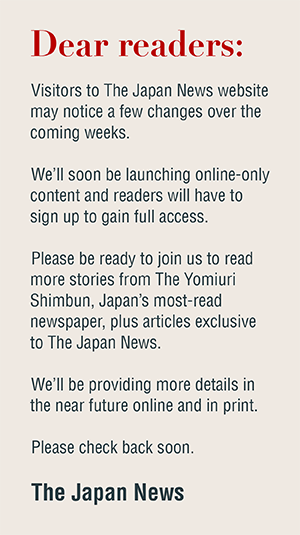 The terms and conditions for linking to Yomiuri Shimbun websites are detailed in the Information section on the top page of The Japan News website. The Yomiuri Shimbun denies a link when it determines that the linking will result in the distortion of the purpose of its editorial policy. No linking to individual articles is, in principle, permitted. If you have a special reason for linking to any specific articles, you are requested to explain the reason to The Yomiuri Shimbun and obtain its prior permission. Do not use the content in a way that may injure the prestige of The Yomiuri Shimbun or may lead to economic damages to The Yomiuri Shimbun. Do not use any registered logo or other trademarks that are owned by The Yomiuri Shimbun. Do not use any link to any website of The Yomiuri Shimbun as a means of commercial activity. Make it sure that your link to any Yomiuri Shimbun news page is clearly recognizable to any third party. Do not use any link button of your own making. Do not use any frame of your own making for a link to any website of The Yomiuri Shimbun. Be expressly aware that the act of having your website linked to The Japan News website after displaying any news headline from The Japan News website is tantamount to using a publication the copyright of which belongs to The Yomiuri Shimbun, therefore constituting a violation of the Copyright Law. When you desire to have a headline or headlines posted in your link to The Japan News website, you are requested to obtain prior permission to do so from The Yomiuri Shimbun. The Yomiuri Shimbun may charge a fee for the use of a headline or headlines. The Yomiuri Shimbun and any of its information suppliers shall not be liable for any problems, including those that may develop into a lawsuit, over anything relating to your Web site linked to any Yomiuri Shimbun Web sites. Any such problems shall be dealt with on your own account and at your cost. If The Yomiuri Shimbun incurs damage as a result of your Web site's link to its websites, The Yomiuri Shimbun may demand indemnity for the damage done. This condition shall apply to any case in which a link to any Yomiuri Shimbun Web site is established without prior permission of The Yomiuri Shimbun.. 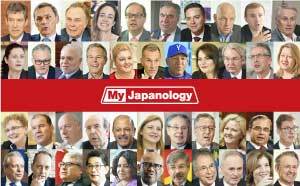 If you want to link to the Japan News website, inform the Intellectual Property Department of the Yomiuri Shimbun of the name of your website, , its content, the purpose of your link and your full name and address.